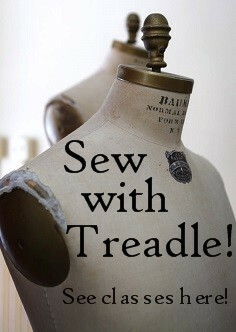 Hi Treadle fans, Elizabeth here, sharing my pick of the week! When I saw this embroidered denim at the store, I was instantly in love! I knew I wanted a quick, easy garment. A skirt would be perfect! I used McCall's 7439 (view D). To avoid cutting too much embroidery, I placed the center back seam on a fold instead, then moved the zipper to the left side seam. 2 1/4" yards allowed me to place the pieces cross-grain along the border with no margin! I didn't make the included belt; instead I made a sash from coordinating shot cotton from my home stash. This skirt is currently on display at the store if you need a closer look! We have more than the usual amount of unicorn prints right now, and why not? Unicorns are fun, magical, and lovely! Take a look! This print has metallic golden trees for a majestic sparkle! This large-scale print with clouds and rainbows is filled with color. This printed cotton jersey knit is on the subtle side, with small pink unicorns and rabbits scattered among the foliage. Do you love unicorns as much as we do? And a few fun patterns! This linen piece has a subtle, organic print. Dark indigo chambray takes advantage of linen's great visual texture. This kelly green damask has a beautiful, subtle pattern woven in. And of course, there are always plenty of solid colors, too, like this new soft lavender! Today, Rebecca is telling us all about her number one favorite tool that everyone needs: a great pair of scissors. "I love Ginghers, I always have. I have probably 6 to 8 different pairs of scissors. Every one does a different thing!" Rebecca recommends buying "the best pair of scissors you can afford, and as many as you need." Including a nice pinking shear! Even the best scissors need occasional maintenance. "The nice thing about Gingher is that you can send them to the factory, where they take them apart, sharpen them the correct way, and put them back together." You can read more about this on Gingher's service page. Come for the fabric - stay for the sewing! We have a great selection of new cotton shirting in the store, from whimsical bicycle prints to classic, subtle stripes and checks. Of course shirting is a great choice for shirts, but don't stop there. Skirts and dresses are equally successful in this smooth, crisp cotton. SEWING FUN FOR A GOOD CAUSE! We had such fun last fall sewing school tote bags and baby bibs. Thanks to those who helped us sew 13 school tote bags and fill with school supplies, plus over 20 baby bibs! Those items were donated to families in transition through local non-profit, Sew Good Goods. Bags are pre-cut - all you do is pin & sew! Sewing machines will be fired up & ready to go! You are also welcome to bring your own machine. Join us for as long (or as short) as you like. Please call Treadle 651-698-9690 to reserve your space. WHY: Sew Good Goods is a local non-profit that embraces the notion that in creating and giving hand-crafted goods a unique connection is made and shared. Tote bags will be filled with personal hygiene items and donated to local food shelves through Keystone Community Services. 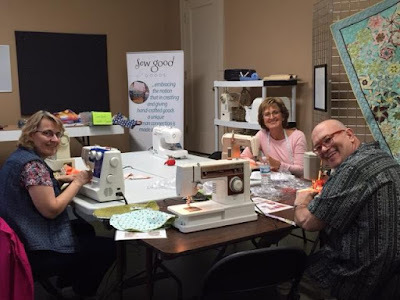 Don't sew, but want to help? 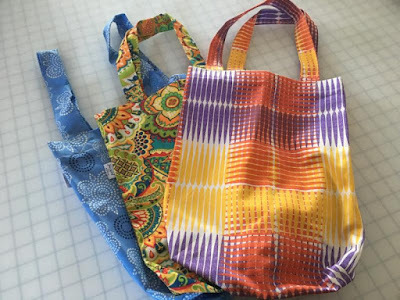 Treadle will be accepting donations of personal hygiene items to fill the tote bags. We have a bunch of new cotton jersey knit prints! 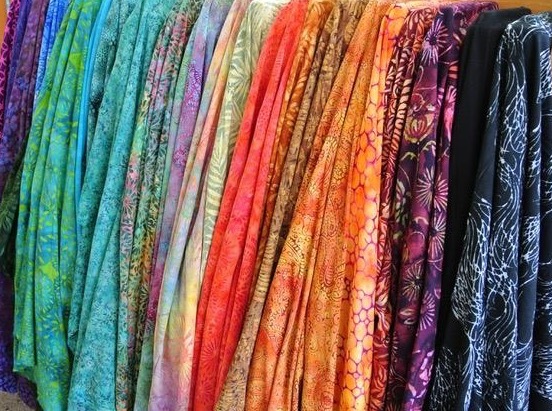 Perfect for dresses, tops, skirts, or even jammies for adults and kids! We have a few gorgeous new faux leathers in the store: two in shimmery metallic and one in jet black. This faux leather is perfect for jackets and skirts! You could use it alone, or just a bit for accents. Accessories like purses, bags, and gloves would also be gorgeous! Today's Treadlette is Sue. Take it away, Sue! "I think I started sewing in 6th grade. I hated it! I had two older sisters who were clearly better at and much more interested in it. I just remember ripping a lot of stuff out and in the end the top I was making not fitting the way I wanted it to. I didn’t really begin to enjoy sewing until I was in graduate school and needed dressy clothes for my music recitals. I didn’t want to look like I just attended my junior prom while I was up on stage, so I knew I would have to sew dresses that suited my personality. In hindsight, sewing on slippery, silky fabrics was a tough way to work on my sewing skills—kind of trial by fire. "I think I’ve been at Treadle for 24 years, if I remember correctly. I used to work a lot of daytime hours, but now I only get to be at Treadle on weekends. "I didn’t grow up in Minnesota, so when I moved here, I knew I would need warmer coats, so I started sewing coats. This is still my favorite thing to sew—jackets of just about any kind, but especially outerwear. I’ve done a lot of polar fleece pullovers and supplex jackets, a trench coat for my husband, and several wool coats and jackets. "Probably my favorite fabric to sew with now is just about any kind of knit. It started when my kids were younger and they both really needed to move. Knits were the answer for how active they were. Then I also became unwilling to buy cheap knit garments, of course, thinking I could sew them better and make them fit better. Now there are so many great companies doing knits, Telio and Art Gallery, to name a few, that finding good quality knits is much easier these days. "My latest project, still working on it, is Vogue 9244, the new Marcy Tilton jacket, that I will put up for display in the shop once it’s finished. "One last thought is something we always say to our Treadle customers, please bring in your finished projects so we can congratulate you and see your work. I sometimes think people think we aren’t really interested, but I personally truly enjoy watching our customers grow in their love of sewing. I get inspired when they share their projects." You can see all of our Get To Know Us posts here! We have a lot of great denim in the store right now with interesting woven or printed patterns. Take a look! This striped fabric is double-sided. Brushed cotton stripes on one side. . .
Classic dark indigo denim on the reverse! This embossed-look denim has been very popular! The leaf print on this denim print is softly abstract. Printed daisies are cute and casual. Okay, so this one is technically a chambray, not a denim, but the embroidered border is so gorgeous I can't help but include it! Fancy denim not your style? We have a great range of weights and shades in plain denim, too! We have new Liberty prints! Some are the silky cotton lawn you know and love, and a few are crisper cotton poplin! But all of them are gorgeous, classic Liberty prints.